Preheat oven to 350˚F. Heat the oil in a large pot over medium heat. Add the onion, bell pepper, celery and garlic and saute for 4 to 5 minutes. As the onion becomes translucent, add the tasso and continue to saute for 1 to 2 minutes more. Add the eggplant, chicken stock and shrimp. Mix thoroughly and remove from the heat. 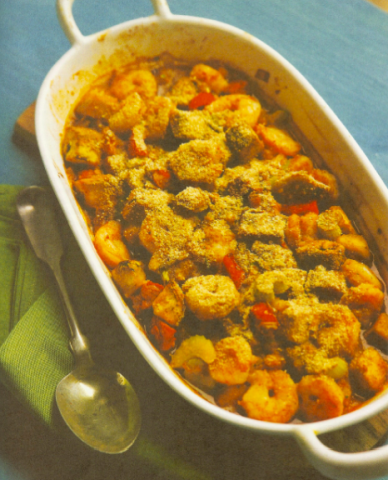 Stir in the breadcrumbs slowly, allowing them to absorb the stock. Season with Creole seasoning and pepper to taste. If the overall mixture becomes too dry add a bit more stock to moisten it. 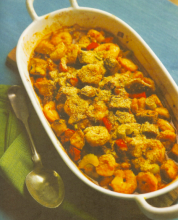 Spread the mixture it a 3-quart casserole dish and bake for 20 minutes.